StarTech on Thursday announced two new Thunderbolt 3 miniature docking stations that the company made more affordable than existing 4-in-1 docks. The Mini Thunderbolt 3 Docks feature two 4Kp60-capable display outputs, a USB Type-A header, and a Gigabit Ethernet controller. StarTech’s family of Mini Thunderbolt 3 Docks consists of two models: the TB3DKM2DP with two DisplayPort 1.2 outputs enabled by the TI TPS65983 controller and the TB3DKM2HD with two HDMI 2.0 outputs enabled by the Parade PS176 controller. In addition to display outputs, the mini docks feature one USB 3.0 connector driven by ASMedia’s ASM1042A as well as a GbE header controlled by Intel’s WGI210AT chip. Unlike higher-end Thunderbolt 3 docking solutions from StarTech and other suppliers like OWC and Promise, the TB3DKM2-series cannot charge notebooks (which means that these laptops will need to use an extra TB3 port for charging). Furthermore, since the mini docks are based on Intel’s Alpine Ridge controllers, it's also worth noting that they only compatible with TB3 host ports and can't fall back for pure USB Type-C hosts. A clear advantage of StarTech’s Mini Thunderbolt 3 Docks over full-fledged docking stations are their miniature sizes as well as lower prices. Their obvious disadvantages are a limited number of USB-A ports and the lack of a model featuring both DisplayPort and HDMI outputs in the lineup (both limitations are conditioned by BOM and production costs). StarTech.com’s Mini Thunderbolt 3 Docks will be available directly from the company as well as from leading retailers like Amazon, CDW, and other. 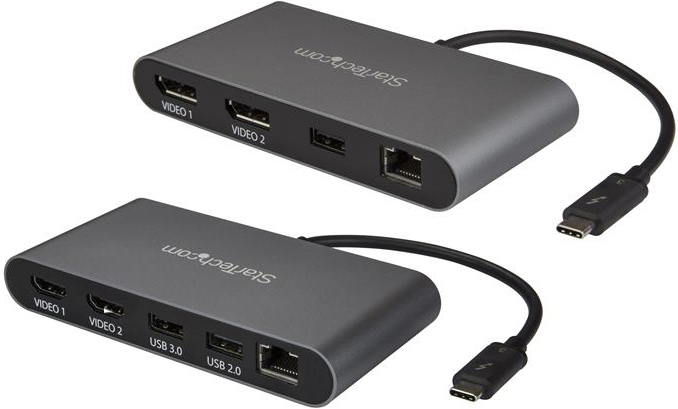 The TB3DKM2DP mini dock with two DisplayPort 1.2 headers costs $122 from Amazon and $164 when bought directly, whereas the TB3DKM2HD with two HDMI 2.0 outputs will be available for $183 in the coming weeks when acquired from the manufacturer. TPS65983 is just "USB Type-C and USB PD Controller, Power Switch, and High-Speed Multiplexer" and i suppose TB3DKM2HD has TPS65983 especially for "USB Type-C ... and High-Speed Multiplexer"
2. But afaik the Thunderbolt controller takes care of the USB-C functionality, because the DisplayPort lines from the GPU are routed directly to the Thunderbolt controller. So it probably sees the USB-C adapter and masquerades as a plain USB-C controller. I am not sure exactly what the port controllers do, though. I thought the NVM firmware for the Thunderbolt controller can affect the power delivery, unless the Thunderbolt controller flashes part of the firmware to the port controller. "Furthermore, since the mini docks are based on Intel’s Alpine Ridge controllers, they are not compatible with PCs featuring USB Type-C headers." Reckon, I have seen Sonnet and Promise release brand new 10Gbps Ethernet devices in the recent weeks. Titan Ridge was announced ages ago. I know for a fact that it is in the hands of manufacturers to develop products with. Intel will probably allow them to sell the products in line with the Z390 chipset launch. Which will not be before the Linux 4.17 kernel reaches stable release, because it introduces Titan Ridge support. Anyways, they couldn't wait a few more months and make something without two year old controllers?